One of the many things to see at the NEXT show in Brussels Expo in Belgium this weekend is Alison Carroll, the new Lara Croft model. She's doing a world tour to promote the upcoming Tomb Raider: Underworld video game, which is slated to be released within less than two weeks for the PC, PlayStation 2 & 3, Xbox 360, Wii and DS . Alison Carroll is spending two days of her world tour at NEXT in Brussels to show off her tricks, hand out signatures or pose with gamers for a nice photo. The 23-year old British babe was announced by Eidos as the new Lara Croft model in August 2008, and one of the special things about her is that she's the first Lara Croft model with professional gymnastic skills. Alison has 12 years of experience as a professional display gymnast, she recently choreographed the junior team that won the British National Gymnastics Championships and has performed in front of Prince Charles. 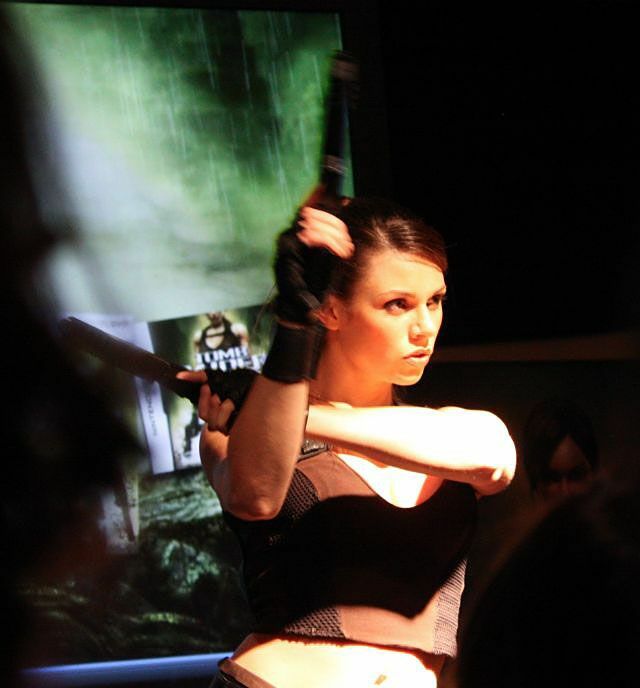 Besides being a professional gymnast, she's also a hottie and perfect for playing the role of Lara Croft. Here are a couple of pictures I shot at NEXT on Saturday November 8 at the Arena 51 booth. She gave a three-minute long act, playing with her guns and showing off some of her gymnastics skills. Tomb Raider: Underworld will arrive in North-America on November 18 and in Europe on November 21. It's developed by Crystal Dynamics and is the eight game in the Tomb Raider series. In this new action game Lara will be searching for Thor's hammer, taking her to places all around the world. Eidos has confirmed there will be levels in the jungles of Mexico, the coast of Thailand, frozen islands of the Arctic Sea but also beneath the Mediterranean Sea. The game is a direct sequel of Tomb Raider: Legend and it will introduce several gameplay improvements to make the game more realistic. Lara will have new moves, there will be a better combat system and the game will have much better physics. In Underworld the world around you will be much more interactive and persistent than in the previous Tomb Raider games. For instance, destruction to the environment is permanent, mud will stick to Lara until it's washed away, rain will make it harder to find grip while climbing objects and dead bodies won't magically disappear. For the fans of Lara Croft I've uploaded the full 12 megapixel photos at Rapidshare. 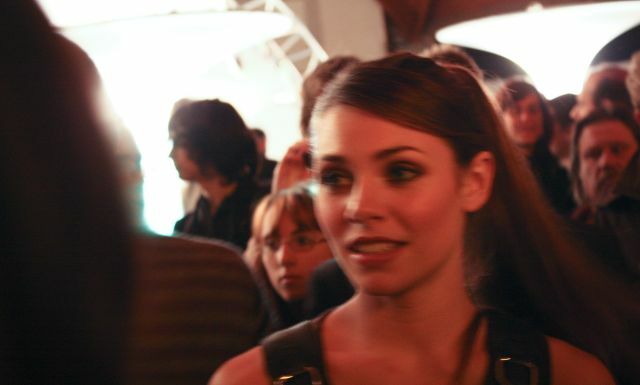 My apologies for the bad image quality though, it's not easy to take good pictures of fast-moving models in low-light conditions when there are dozens of gamers around you who are craving to see some of Lara Croft's flesh.